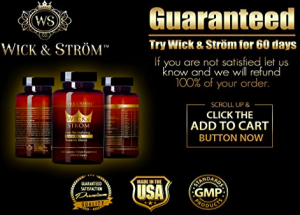 Home » Hairloss Restoration Both Sexes » Wick & Strom Hair Loss Vitamins – Could This be Real? What Are Users Saying? Read through the Review Here! What Is Wich & Strom Hair Loss Vitamins ? 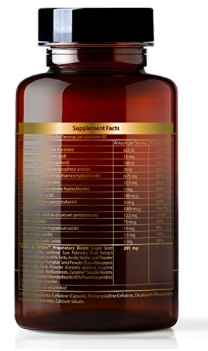 The Hair Loss Vitamins is manufactured by Wick & Strom and it is marketed as a uniquely formulated dietary supplement to manage premature hair loss. The manufacturer states that it incorporates natural vitamins and minerals (without any harsh or harmful chemical) and should invigorate the hair while optimizing a healthy hair growth. Wick & Strom promotes to have had thousands of satisfied customers who eventually made their hair care products a routine. Additionally, they mention that their Hair Loss Vitamins is the most advanced vitamins complex ever made. Their other hair products are the anti-hair loss shampoo and the hair loss topical formula. 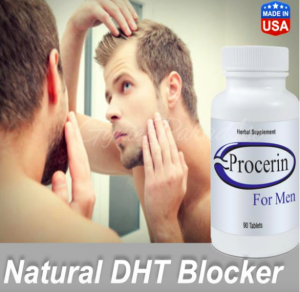 The product can be combined with other hair loss treatment formulas (by Wick & Strom) and is available for purchase in third party website and in the company’s official website. They do offer guarantee. Could this be a sign that their product(s) achieve its claims? Biotin, Grape Seed Extract (Vitis Vinifera), Nettle Leaf Powder (Urtica dioica), Pumpkin Seed Powder (Cucurbita pepo), Saw Palmetto Fruit Extract (Standardized to 45% Fatty Acids), Bioflavonids, Gotu Kola Herb Powder (Centella asiatica), Ginkgo biloba Leaf Powder, Cynatine Soluble Keratin, L-Lysine HCI, L-Proline, Inositol (Standardized to 95% Proanthocyanidins), Silica (as silicon dioxide), Vitamin A, Vitamin C, Vitamin D, Vitamin E, Vitamin B1 (Thiamine HCl), Niacin, Vitamin B6, Folate, Vitamin B12, Pantothenic acid, Iodine (as kelp), Magnesium, Zinc, Copper. Each Wick & Strom Hair Loss Vitamins is available in a container of 120 capsules (two months supply) and should be taken at a dose of two capsules daily. The action of the Wick & Strom Hair Loss Vitamins is said to be an overall effects of the respective ingredients in it. Saw Palmetto: Contributive to the hair loss process is the conversion of testosterone to Dihydrotestosterone; a process catalyzed by 5-alpha reductase. Saw palmetto is known to block this enzyme therefore stopping the production of DHT; a key to preventing hair loss. Biotin: This helps to inhibit the growth of weak and brittle hair. It increases the elasticity of the hair, thereby wrapping the hair in a protective layer that prevents it from becoming brittle and weak. Vitamins E, A and C: These serve as the building block for the hair. Who Can Use Wick & Strom Hair Loss Vitamins ? Hair Loss Vitamins is for both men and women who want to reverse their hair loss process and maintain a healthy hair growth. If I am in this group and wish to stop hair loss and grow hair, the manufacturer of this hair loss treatment formula claim it’s for me. The maker of Hair Loss Vitamins implies that folks who want a safe/effective alternative to surgery and prescription medications to treat hair loss would find this product beneficial. Wick & Strom Hair Loss Vitamins is not intended to diagnose, prevent, treat or cure any disease or ailment. It should be handled and used by folks who are up to the age of 18. The proportion of the ingredients contained were not stated. 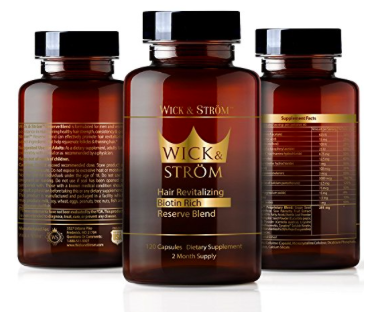 The Wick & Strom Hair Loss Formula is accompanied by a refund. 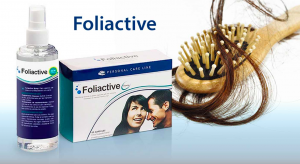 That is, unsatisfied users of this hair loss treatment product within 60 days of purchasing it can contact the manufacturer for a refund if they are not satisfied. Of course, I am not an exception. At the Amazon retail website, they do cover terms and conditioning regards any of the products sold from them. According to them, the formula is a standard/advanced hair growth vitamin complex in the market containing natural ingredients, hence should not be harmful to the body. They seem to have other hair loss treatment formulas in the market, which one can combine with their Hair Loss Vitamins for best results. There are quite a number of positive reviews from previous users of the product and we can reach them through the channel(s) provided in their official website. Hair Loss Vitamins by Wick & Strom as we have seen portrays unique benefits of reversing our hair loss process and re-growing the hair. Can we now say that this hair solution formula is a real deal? We should be able to decide on this based on the genuineness of the details gathered so far. Undoubtedly, Hair Loss Vitamins should address the issue of premature hair loss in users, yet no clinical study is seen to back up the product claims. Having this in place will add more credibility to the product. It promotes to be a naturally formulated product, hence should be compatible with our body system. Positive feedbacks were seen from previous users of the product and I will say that this validates the manufacturer’s statement of having satisfied a large population individuals. What about my personal thought about this formula? 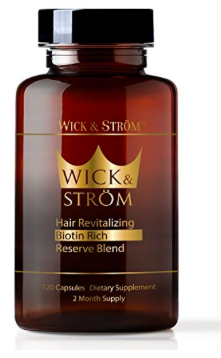 Interestingly, I could recommend the Wick & Strom Hair Loss Vitamins on Amazon (www.Amazon.com/Hair-Loss-Vitamins) for the purported use as it’s a dietary supplement with natural ingredient profile. Do well by checking it out yourself to experience its effects, then come back to me and let me know your results. Your concerns are welcome here, so feel free to leave them below! Previous Post Rogaine for Women – Does Women’s Rogaine Work? Reviews from Results Here ! 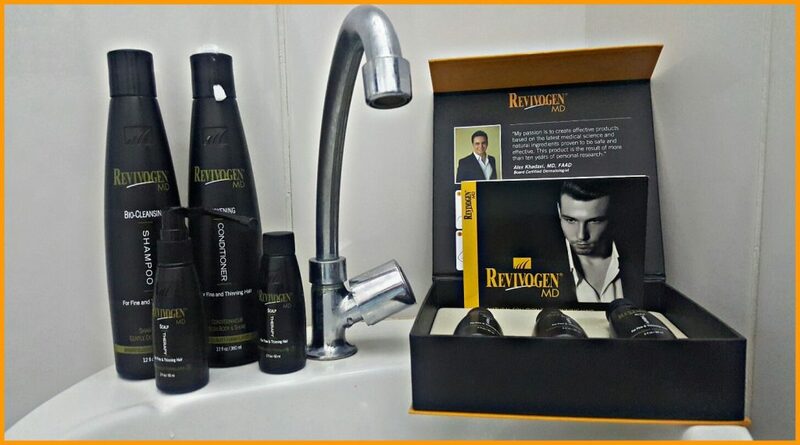 Next Post Rogaine Reviews – Is this Effective in Re-growing Hair or Is There Any Side Effects? Get on the Review! 2 commentsOn Wick & Strom Hair Loss Vitamins – Could This be Real? What Are Users Saying? Read through the Review Here! The first time I used it it caused my heart to pound extremely hard and quickly. It actually scared me so I’m not going to take it again. I had to take a sedative to calm my heart down. Really? Wow, yeah I do know that there are some effective herbs and ingredients in the supplement proprietary blend. Well, thanks for letting us know and sharing as this will help.